Third in the series is Sasha Kramer, who co-founded SOIL in Haiti. 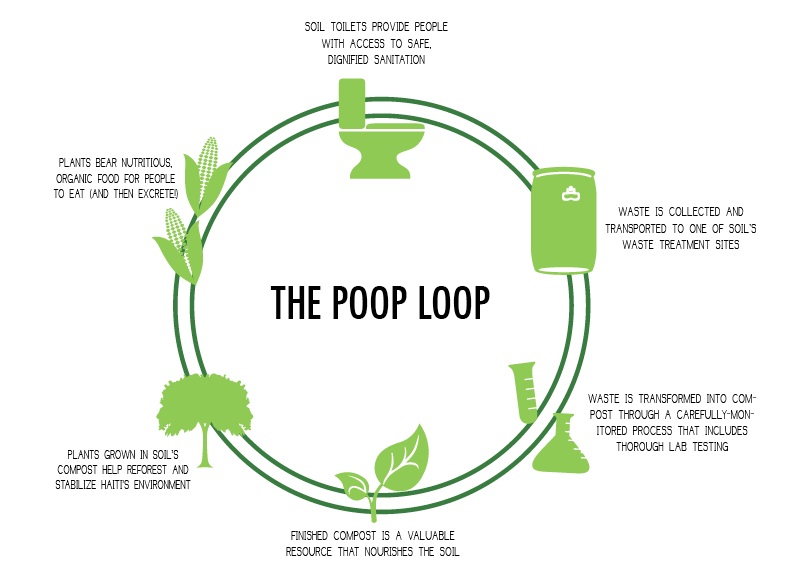 The organization develops social business models around ecological sanitation, a process in which nutrients from human waste return to the soil rather than polluting fresh water resources. I traveled to Haiti in 2004 in the wake of a coup as a human rights observer, never dreaming that nearly 15 years later I would still be living and working in a country that I love so dearly and have devoted myself to. As I came to know Haiti and build relationships with community leaders and activists, I realized there was an elegant solution that could simultaneously leverage my training as an ecologist and address one of the primary challenges facing communities in Haiti: a simple, locally driven, ecological approach to sanitation. My organization, SOIL, was founded in the spirit of working side-by-side with communities to build ecological sanitation solutions that could be community-led, and that idea has evolved into the social business that we’re currently refining, EkoLakay. EkoLakay was born in part out of the lesson we quickly learned, that people in impoverished communities do not have the time nor the capacity to voluntarily manage a shared community toilet facility. There is often an assumption that need correlates to willingness and ability to volunteer, when in reality the opposite is true — those with the greatest need are expending their time and effort keeping their families safe and healthy as best they can. At SOIL, this was an opportunity to evolve our thinking and develop a solution that was truly sustainable — a social business that could provide livelihood opportunities in addition to ecological sanitation services. I have been blessed with incredible opportunities, particularly in education, and I have found incredible support and guidance from professors throughout my life, who helped me to learn rigorously, defend my ideas and — perhaps most importantly — think critically and never step back from asking questions. Women often face skepticism and disbelief in the workplace, and particularly in traditionally male fields like science and technology. I’ve faced that skepticism by respectfully questioning, and standing up whenever I felt my voice and presence were being silenced. Listen and learn from others, be respectful and humble, but don’t take no for an answer, and never be afraid to take up space or ask people for what you need, whether that’s time, support, expertise — anything. It has been an inspiration to see this work catching on around the world. Over 10 years ago when SOIL was founded, we were pretty unusual. Now we are part of a formal alliance of practitioners working on similar sanitation solutions around the world, and I’m overwhelmed by the gathering momentum behind this idea that sanitation can be so much more than just a toilet. As best they can, large institutions need to let locally based organizations lead, and be responsive to our commitments and rationales behind why we choose to do our work the way we do. I’m proud that SOIL has always followed the science and the research, rather than distorting our mission, vision and priorities to obtain funding. This often makes it difficult to accept funding from large institutions due to stringent requirements, and we’re excited and grateful that we’ve found a pathway to collaboration through USAID’s Development Innovation Ventures fund — these types of funds are incredibly important for supporting smaller organizations and initiatives on our terms. Editor's Note: This entry originally appeared in USAID's 2030: Ending Poverty in this Generation publication on Medium.com.